You’ve seen them, the robust black crickets with round heads that invade your household, especially in the autumn. 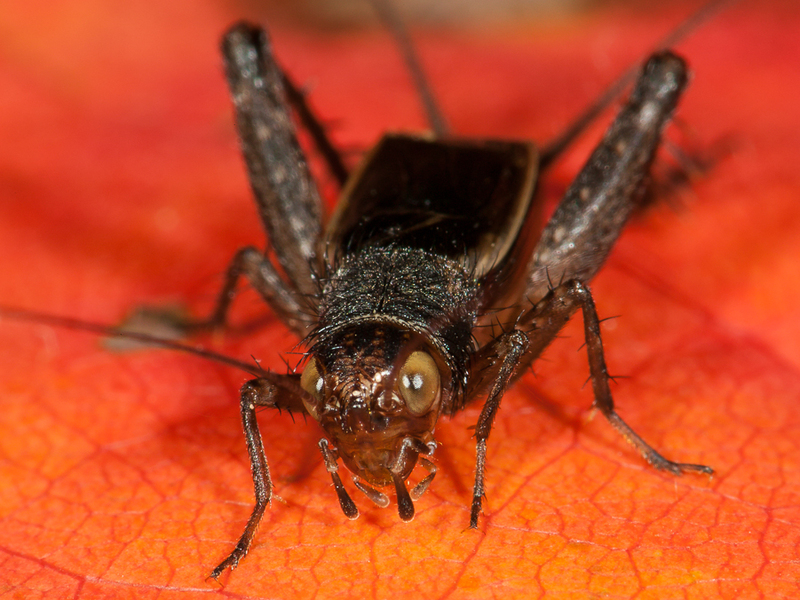 These are the field crickets, endearing creatures looking for a cozy home. There are about twenty native species in North America, represented by five genera, with thirteen species in our region. 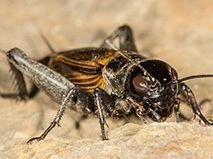 Three wide-ranging field crickets are profiled in this book, two being members of the genus Gryllus, the most-studied group of all our singing insects. 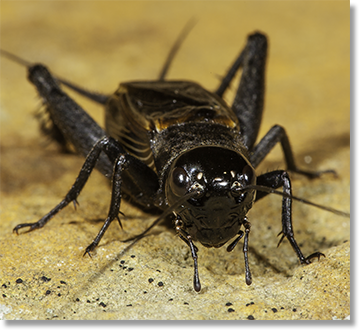 While the majority of our native field crickets are shiny black in color, there are exceptions, such as the gorgeous Eastern Striped Cricket (Miogryllus saussurei), which sports a coat of dark brown and cream. 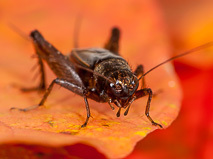 In addition to our native field crickets, there are several introduced species in North America, including the brown-colored House Cricket (Acheta domesticus) and an Asian cricket that is sold for fish bait and as pet food (they are not covered in this guide). 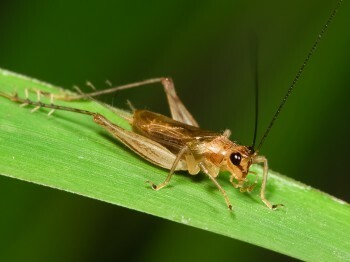 Field crickets are found in nearly every habitat that has sufficient moisture. From rock crevices in city sidewalks to grassy patches among sand dunes at the beach, their songs fill the summer air from June until frost. Most species either chirp or trill, and songs usually have a melodic quality. Singing males can be difficult to find, as they hide under rocks, leaves, and other debris, and go silent whenever they are disturbed. 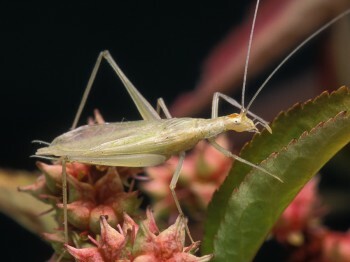 Interestingly, most male field crickets, and males of other cricket groups as well, are “right-handed singers,” meaning that their right forewing sits on top of their left forewing (in contrast, most male katydids are “left-handed singers”). 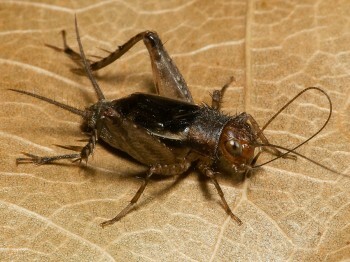 The pleasant chirping of these crickets is commonly heard. Spritely chirps at about 4 per second. Trills with unevenly spaced pauses going on for minutes. An evenly spaced series of beautiful upward chirps. 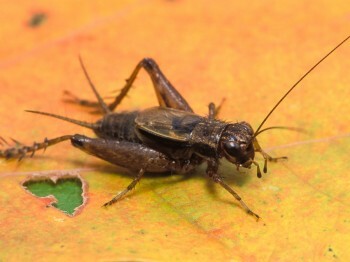 A rapid series of short chirps similar to Field Crickets. 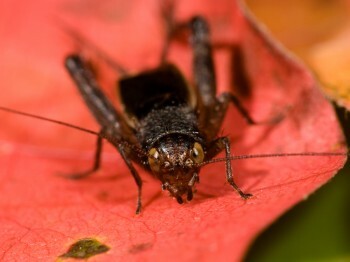 Have you ever walked across a grassy meadow or lawn and noticed large numbers of small black crickets scurrying to get out of your way? 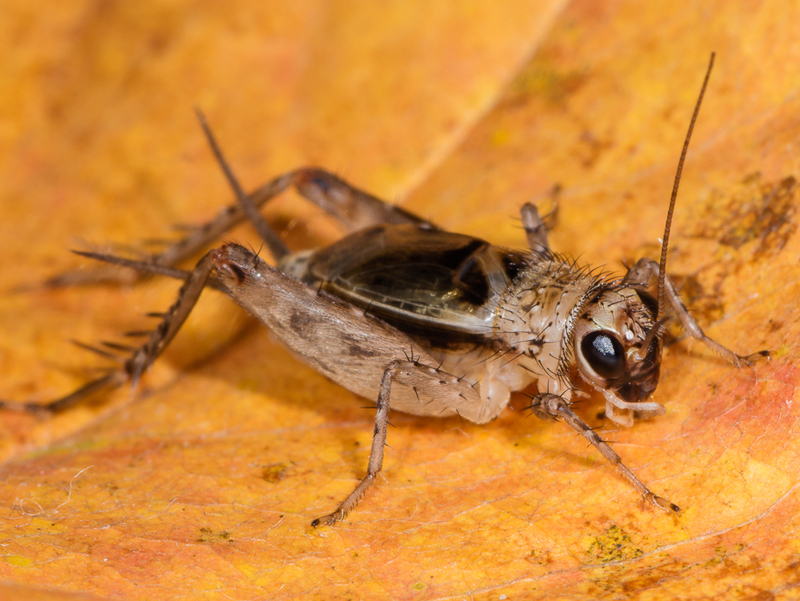 Did you think these must be “baby” crickets, because they appear to be miniature versions of the larger field crickets that you’ve found in your home? 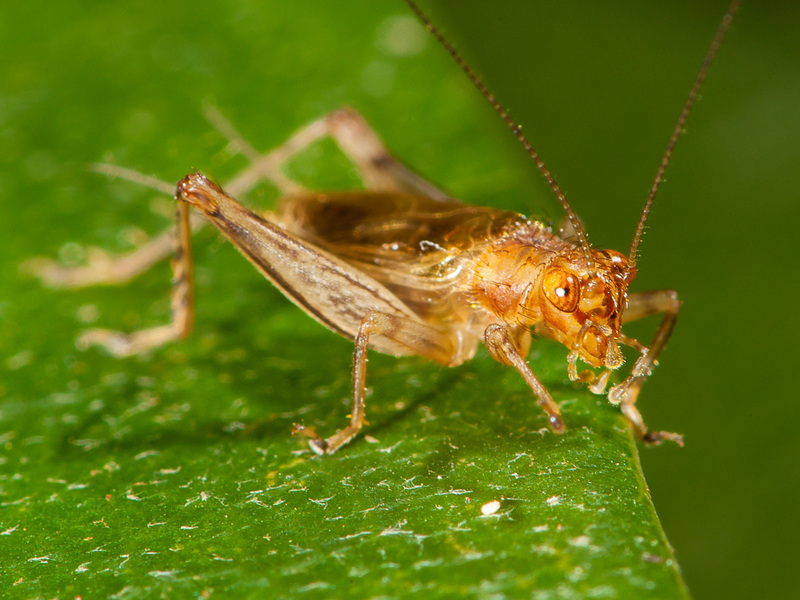 It may come as a surprise that these are actually adult or near-adult crickets belonging to the ground cricket group, a diverse assemblage of twenty-five North American species, representing five different genera (twenty-three species are found in our region). 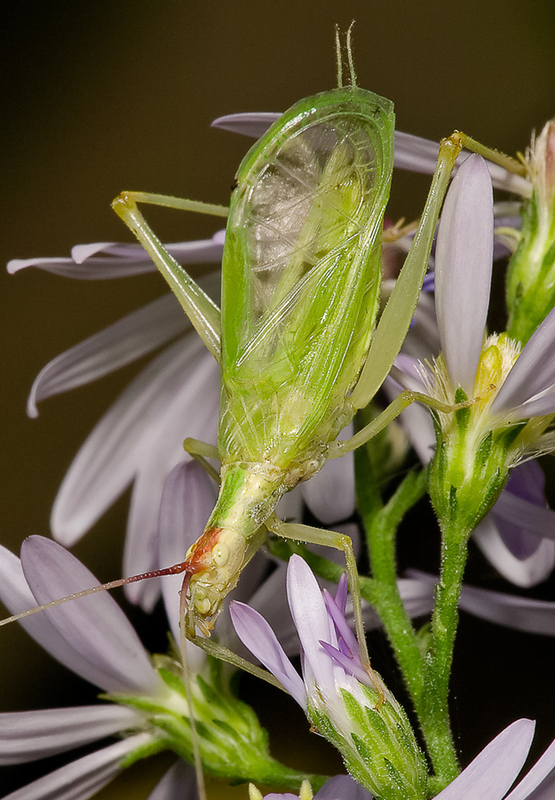 This guide presents six species from three genera, seemingly a small number, but we feature several common species that are the most likely to be seen and heard in the wild. 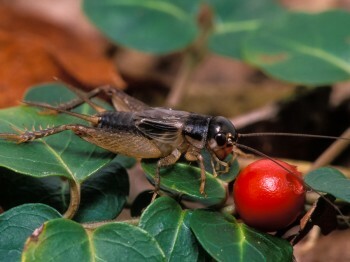 Collectively, the ground crickets are characterized by their small size and black or dark brown bodies and by their loud, musical trills and chirps. 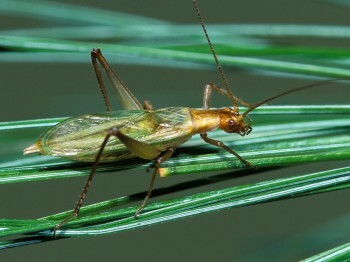 In appropriate habitat, they may be extremely abundant (for instance, if you own a swimming pool placed level with your lawn, you probably see a lot of them, especially after you mow, because they will hop across concrete walkways and fall into your pool and drown). 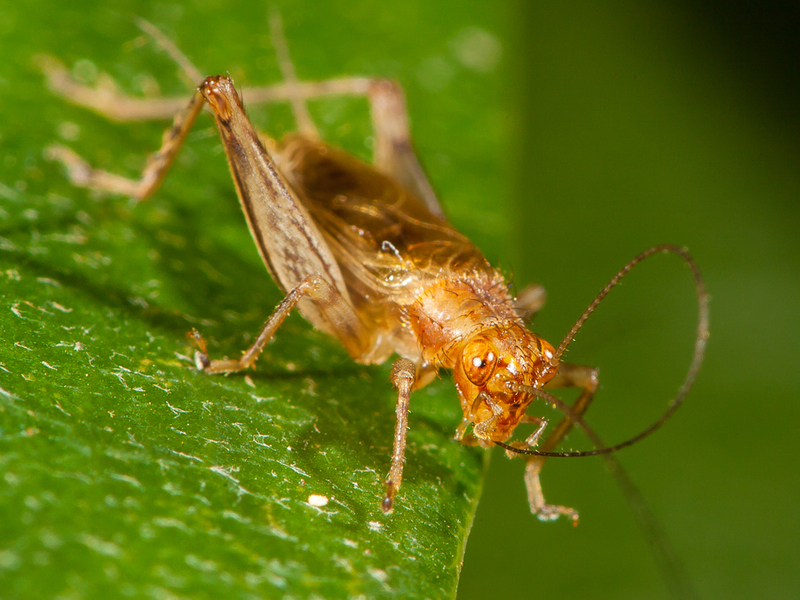 Since ground crickets all look basically the same, identifying different species by sight is next to impossible. But many have preferred habitats, and nearly all can be distinguished by their songs. 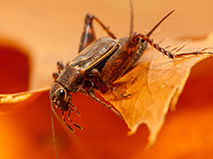 A common song-theme for ground crickets is a continuous trill, but the trills of different species are delivered at different rates, and they also vary considerably in quality, ranging from melodious or tinkling to rather atonal or buzzy. Still other species produce a distinctive series of chirps or short trills. 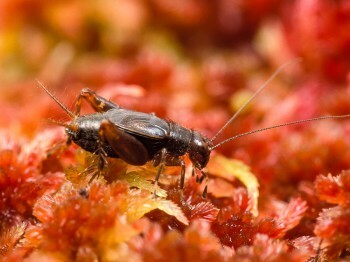 Although male ground crickets sing loudly, they remain well hidden and are a challenge to find and collect. When disturbed, they either retreat into nooks and crannies or else try to run or hop away. You can collect them by chasing or coaxing them into a vial or small jar, driving them onto a net laid flat on the ground, or sweeping the grass with an insect net. A beautiful silvery trill that is too fast to count. A pulsing rapid trill that seems to stumble now and then. Short, two-syllabled chirps heard from leaf litter. Evenly spaced short trills from grassy areas. Bright, silvery, quiet, high-pitched trills from bogs. Pleasing, continuous trills from leaf litter. A lilting, continuous series of chirps separated by the length of one chirp. A bright, silvery trill just slow enough to count the chirps. A variably long trill that starts softly. 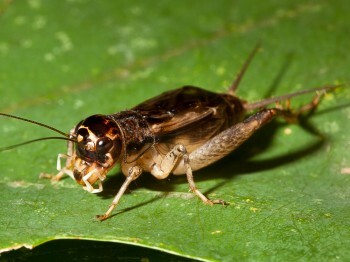 Most people think that all crickets look the same: compact, dark-colored, short-winged insects with body plans like those of the field crickets and ground crickets. 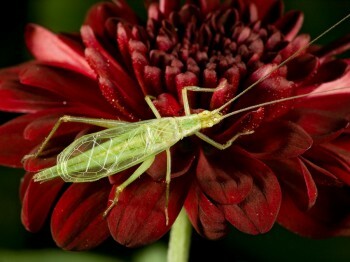 So it may come as a surprise to learn that there is a group of crickets with an entirely different appearance — delicate creatures with translucent green or red-green bodies and long lacy wings that they hold straight up when they sing. 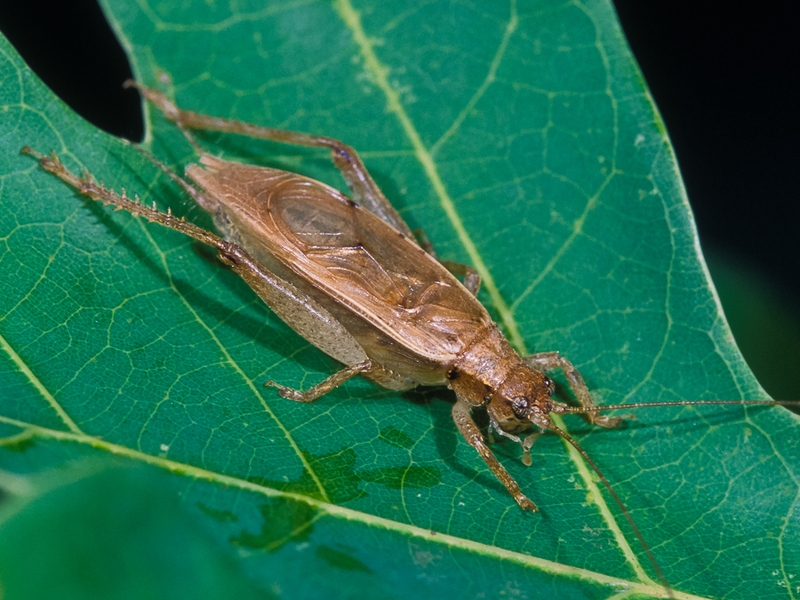 These are the lovely tree crickets, whose pure-toned trills enliven the nighttime soundscape in a variety of habitats, from weedy fields and shrubby clearings to deciduous forests and pine woods. 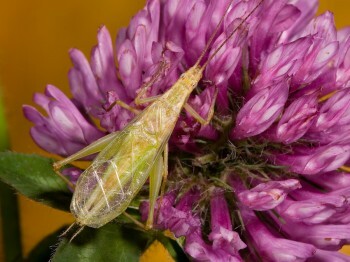 There are eighteen species of tree crickets in North America (represented by two genera), and twelve of these are found in our region. We include profiles for nine of the most common and widespread species. Among tree crickets, the dominant song pattern is a loud, continuous, musical trill. Species giving such trills are difficult to identify by song alone because the differences in pulse rate or frequency can be subtle (although with practice, these differences can be learned). But there are species that can be identified by song. 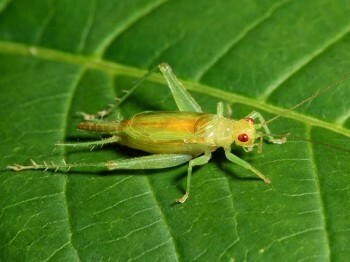 For instance, the Snowy Tree Cricket gives a steady stream of distinctive melodious chirps, and the Narrow-winged and Two-Spotted Tree Crickets produce telltale broken trills. 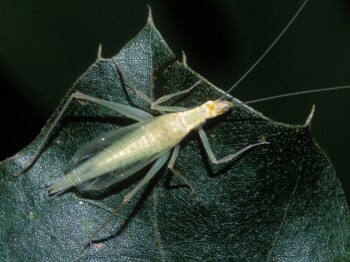 Interestingly, males of a number of species often sing from the underside of a curled leaf, from the edge of a leaf, or from a hole in a leaf, in order to reduce acoustic interference and thereby increase the intensity of their songs. 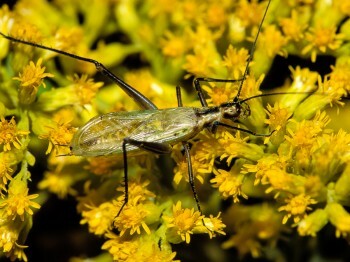 Habitat can be a clue for identification — for instance, the Pine Tree Cricket sings almost exclusively from pine trees, and the Broad-winged Tree Cricket sings from low vegetation such as goldenrods and bramble. Some tree crickets are also unique in appearance, but there are a number of look-alikes that can usually be separated by the pattern of black marks found on the basal segments of their antennae. 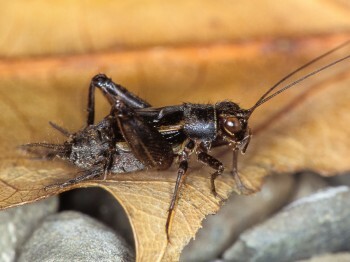 The mating behavior of tree crickets is fascinating. A male fiddles his tune to attract a female. 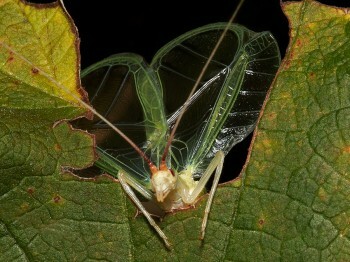 Once she arrives, he raises his forewings to allow her to climb onto his back. 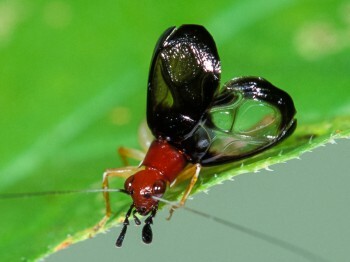 At the base of his wings, there is a small pit or gland that exudes a sweet liquid, which the female begins devouring. While she is occupied, the male transfers a sperm packet to the female and his sperm slowly begins to make its way into her. The longer she feeds from his gland, the higher the probability that the male’s sperm will fertilize her eggs. A mellow continuous trill from brambles evening and night. A mellow continuous trill from brambles day and night. A loud continuous trill heard at night in weedy fields. A mellow continuous trill from deciduous trees at night. A rapid trill from weeds heard day and night. A continuous trill heard both day and night. Mellow trill of variable length, often short. A continuous musical trill at night from evergreens. Pleasant series of chirps sung in synchrony with other males. A plaintive, dissonant trill from trees at night. 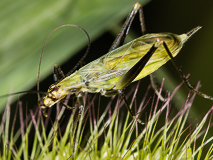 Also called sword-tailed crickets because of the sword-like shape of the female’s ovipositor, the trigs are a small group of tiny crickets that are easily overlooked, even though they may be numerous in their favored habitats. 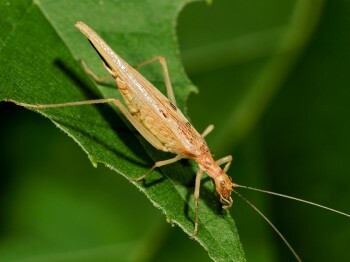 The word “trig” is entomological shorthand for Trigonidiinae, the taxonomic subfamily in which these crickets occur. There are eighteen species in North America, represented by four genera. We include profiles for three species (in three genera) that are fairly common and widespread in the East. Trigs range in color from reddish brown (Say’s Trig) to bright yellow-green (Columbian Trig) and even a two-toned red-and-black (Handsome Trig). They inhabit brushy areas, shrubs, and trees, where males often sing while hiding under or between leaves. 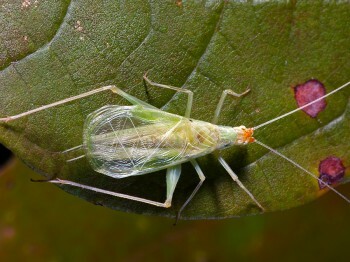 When disturbed, their small size helps them escape undetected. Males have trilling and chirping songs, and choruses can be surprisingly loud, in spite of the diminuitive size of these noise-makers. 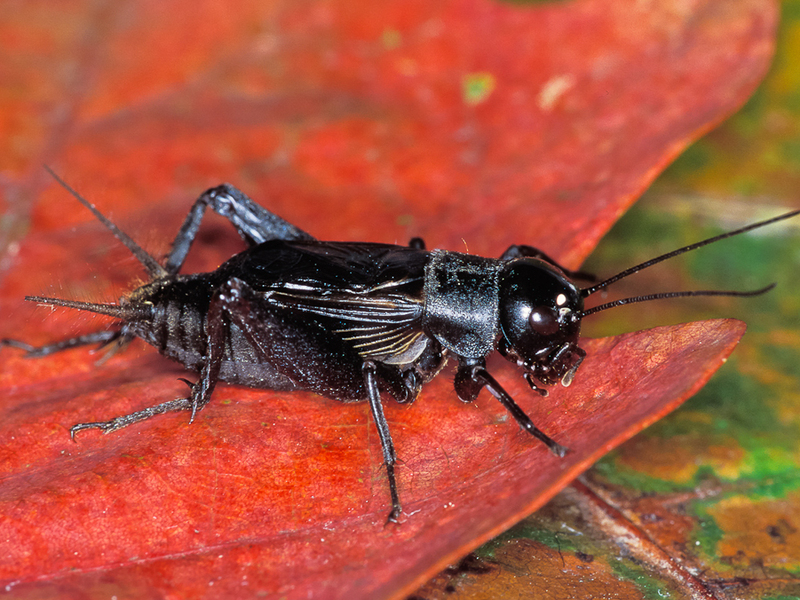 Like tree crickets, male trigs hold their wings nearly straight up when they sing. Brief, clear trills from trees and shrubs at night. A delightful, pulsating from trees and shrubs at night. A rattling broken trill from hedges day and night. A loud, clear, silvery trill heard day and night. A loud, clear, silvery trill. Slower pulse rate than Say’s Trig. A clear, silvery series of chirps at around 4 pulses per second. 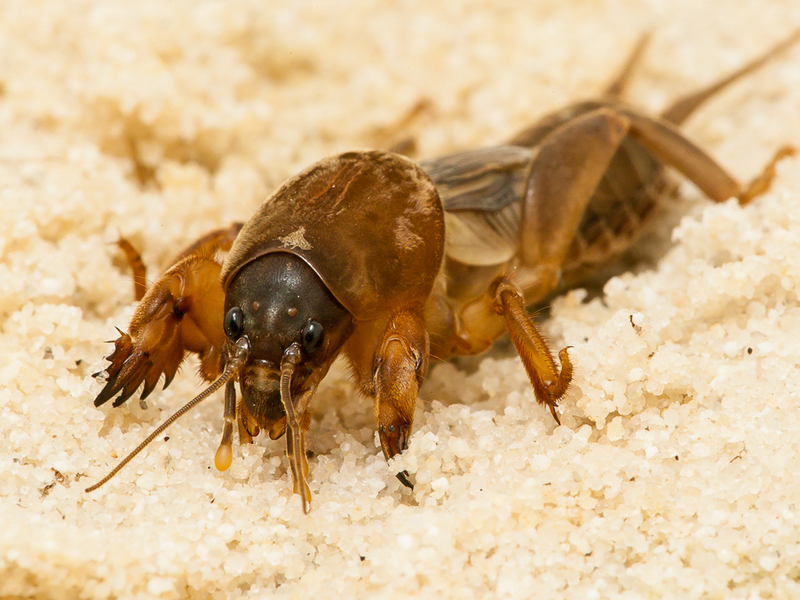 Aptly named because of their mole-like body plan, the clumsy-looking mole crickets have enlarged forelegs adapted for digging. Not surprisingly, they spend the majority of their lives underground, where they dig extensive tunnel systems (although many species are capable of flight). 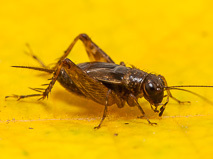 Mole crickets may reach 2 inches in length and can be frightening when encountered. But there is nothing to fear. They cannot bite and are harmless when held (the most they can do is try to dig their way out of your hand). 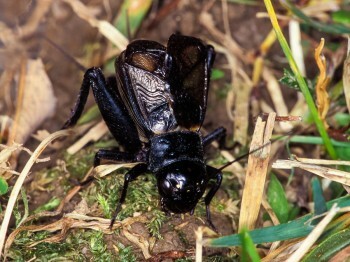 There are seven species of mole crickets in North America, four of them introduced. We include profiles of two species in this guide. 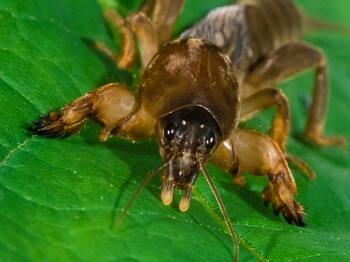 The most widespread in our area is the Northern Mole Cricket (Neocurtilla hexadactyla), which ranges throughout the East. In the southern states, there are three species in the genus Scapteriscus, all of which are native to South America, and all of which were introduced here about one hundred years ago. 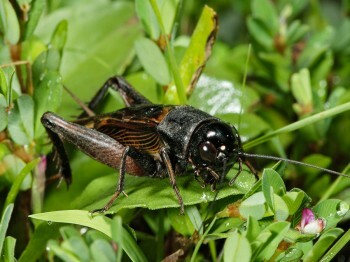 The most wide-ranging is the Southern Mole Cricket (Scapteriscus borellii), first appearing in Georgia in 1904, and now found in coastal plain habitats from North Carolina to Texas. 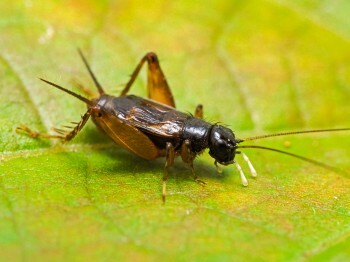 While the Southern Mole Cricket is mostly carnivorous, the other two species of the genus (the Tawny and Short-winged Mole Crickets, S. vicinus and S. abbreviatus) feed voraciously on roots and leaves, and are among the most destructive of all our orthopterans, causing extensive damage to lawns, golf courses, and crops. Male mole crickets sing from their burrows. Within the genus Scapteriscus, males of some species construct horn-shaped entrances to augment their songs and project them skyward. This would make little sense were it not for the fact that females of these species fly prior to mating and home-in on calling males. Mating occurs inside the burrow. 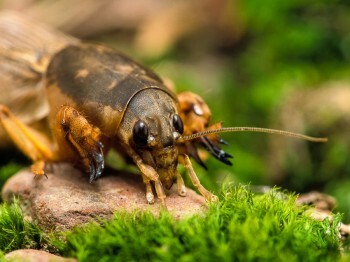 At least in the Northern Mole Cricket, matings occur in a tail-to-tail position with the male lying on his back. After mating, the pair begins to fight, and it is likely that the female ejects the male from his burrow, taking it over in order to lay her eggs. Frog-like trills from ponds and marshes at night. A loud continuous trill at night.